There are only a handful of truly “must have” baby items, but a baby gate certainly fits the bill. Buttons, sockets, shelves, drawers, gizmos and gadgets, and stairs are ultra-appealing to a baby. While they’ll do everything possible to get their hands on these items, it is up to you to keep them far away! That’s why a baby gate comes in handy. There are many different kinds and many different uses for one, so read on to learn everything you need to know and things to consider before buying the best baby gate for your family. You may need a baby gate for a couple of reasons. First, if your home has steps, you’ll need a gate for the top and bottom of each set. This prohibits your baby from climbing up, but more importantly, falling down. A gate also restricts access to rooms that you don’t want them in, like the bathroom or kitchen, especially if someone is cooking. A gate can keep your baby separate from pets, and also keeps them contained, which is important when they start walking. It allows them to be in one room at a time, and it allows parents to maintain their sanity. After all, running after a toddler can be quite taxing! When I started shopping for gates, I had tunnel vision with what I wanted. I was sure that there weren’t many types to choose from—boy was I wrong! I actually found shopping for a gate very overwhelming. But, once I started reading and researching, it turns out that there are two major kinds, and different selections that go from there. The three major “kinds” are hardware-mounted, pressure-mounted, and freestanding, and they all have some pros and cons to consider. Hardware mounted gates need just that to function—hardware. Keep your child safe and secure with the Easy-Swing & Lock Gate. With a safety gate that easily swings closed to self-lock, you never have to worry about forgetting. The sturdy steel metal construction and decorative Soft white finish will complement any home decor. They have a latch that allow the gate to swing open and shut, and the latch isn’t easy for little fingers to figure out, let alone grasp and unlock. Here are a few pros and cons of this kind of gate. Sturdy. Don’t expect any shifting, swaying, and tipping. These gates provide a perfect, tight fit. Permanent. If you want them to be, they can become a permanent part of your home thanks to their latch that allows you to open them with ease (but not your toddler). These are helpful if you have pets in your home. Ideal for stairs since they can’t topple over. Need tools to assemble it. Think screws, a drill, and lots of manpower. But, these gates generally come with instructions to follow. Time consuming. Because you need to do some assemble work, it will take time to put up the gate. You’ll need to do touch ups. Once you remove this long-term use gate, you’ll need to repair your wall or door frame and apply come putty to patch up drilled holes. A pressure-mounted gate is your standard, traditional baby gate. The Easy-Close Gate shuts firmly yet easily with one simple push, keeping your child safe and secure. NOTE: Kindly refer the user manual before usage of the product. The crisp white finish of this safety gate will complement any home décor while its heavy-duty steel construction is built to last! It has rubbery pieces that press against the sides of door frames or walls, which hold the gate in place. The gates are instantly adjustable, so you get an easy, customized fit. Easy to install. These gates require no drilling, which means to screws. No damage. You’ll experience less damage to walls since no holes need to be drilled. Portable. These gates can be moved from room to room, or taken with you when you visit relatives, but still want to maintain the safety of your child. Store with ease. Because you can adjust the length of the gate, it can be made quite compact for storing when it’s not in use. Must step over. Generally, these gates don’t boast the easy to swing entrance. So, expect to hurdle over these high gates, or take them up and down quite often to move through a room. Not great for stairs. Because these gates are easier to push than hardware mounted gates, your little one can knock them over. They are mainly used to block off rooms. Not overly durable. I’ve cracked the handle off my plastic gate several times. This was because it got “stuck” in it’s latch placement. These gates usually fold out into an octagon, rectangle, or diamond/square shape. SAFE & ENGAGING PLAY AREA - ANYWHERE! The North States Superyard Colorplay 8-Panel is an excellent solution for creating a safe playpen for your child, both indoors or outside. Plus, the convenient Folding ABC Play Mat (sold separately) works great with this play yard. It provides extra comfort and sensory stimulation during tummy time or any time! EXTRA LARGE & EASY TO ASSEMBLE: The high-quality, eight-panel yard encloses up to 34.4 sq. ft. and is 26" high. Setting up the Superyard is easy. The eight interlocking plastic panels are pre-connected--simply unfold and connect them together. They're able to stand on their own and they lock into place. Customizable. They can be formed into a locked shape that complements your room’s layout. Portable. Set up a freestanding gate in your home or outside in your yard! Play area. A freestanding gate is pretty much like a playpen with more room. It’s great for parents to set up when they need to cook dinner or pop in the shower, but still keep an eye on their baby. Easy to unlock. Once your toddler becomes strong enough or smart enough, they can figure out how to unhinge the gate, and push out; making their escape. Too big to travel with. While they can be moved outside, they are pretty big and bulky, so a free standing gate isn’t ideal to put on an airplane or throw in your trunk. Before buying a baby gate or two, there are some things you should consider. First, take a survey of your home. Where do you want to put a baby gate? If you have stairs, you’ll definitely need a gate for every set. Do you have a play pen, or are you willing to give a freestanding play yard gate a try? Do you want to to keep an expandable gate near your fireplace? Consider if there are dangers lurking around your home that a gate could help resolve a potential safety issue. When you make a list of how many gates you need (and which kind) before you hit the stores or shop online, you already know what you need ahead of time and aren’t left staring in the aisles, counting out gates in your head! Many parents also purchase a gate or two to keep at their caretaker or relatives’ homes, if they plan on visiting often and don’t want to transport their own pressure mounted gates. Once you know how many gates you want to purchase, where you want to put each one, and the kind that is ideal for each area in your home, there are a few tips to consider before making a purchase. Look for JPMA. This stands for Juvenile Products Manufacturers Association. A sticker gets placed on the packaging or frame that shows it meets international safety standards. Consider safety features. Choose a gate that has spaces that are close together. If you want a mesh panel, choose one that has a fine weave, so little fingers can’t fit through and get stuck. Test it out. Is a gate set up for you at the store? Don’t be afraid to test it out to see if you like it’s sturdiness and ease of access-especially a hardware mounted model, since you’ll be using it everyday. Weight and portability. Will you only be using the gate in your home, or do you wish to bring it with you on vacation? You should pay close attention to your gate’s weight and ability to be compact when not in use. Some airlines will allow you to bring a portable gate on board, so look for a model that will travel well if that is your intent. Now that you know all about the different types of gates and things to consider before buying one, also focus on features that make a baby great awesome. Height. The right height discourages kids from climbing over the gate. So, it should be at least three-quarter of your kiddo’s height (on average, gates must be at least 22 inches high). If your child is extraordinarily tall, opt for a higher gate. Sturdiness. A sturdy design and fit is super important. Be sure to choose a gate that complements your measurements and doesn’t allow for any wiggle room when installed. A safety label (like the one discussed in the above section) is also ultra-important to ensure maximum security. Spacing. Slat spacing is ideal because these vertical bars are about 3 inches apart. So, you won’t have to worry about your child’s head getting stuck (yes, that really is a thing!). Latches and hardware. Be sure the gate you select isn’t overly difficult to install. Gates that need to be wall mounted almost always come with the hardware you need, as well as visual instructions. The latch on your gate should also be accessed with one hand for the days you have your hands full. Try to avoid gates that require you to squeeze and release, as these tend to be the toughest to get open. Click/lock signal. This feature helps you know that your gate is locked when you move in and out of a room. Some gates also boast an alarm/indicator feature, but some parents don’t feel like it’s overly necessary. Installation flexibility. Many gates can be mounted to unique areas. But, from time to time, you might have to purchase an installation kit for these areas. Some gates also adjust to fit oddly shaped areas or very wide ones. At times, you can also slide some hardware-mounted gates out of their wall mountings, which is ideal when you’re entertaining and don't want the gate in the way. Safety gates are never meant to be used a baby sitter. There is never a replacement for a parent, so never leave your child unattended around a gate, regardless of its strength or sturdiness. Move foot stools. Never have anything (like a foot stool) around a baby gate, or toys that your child can stand on inside a freestanding gate/play yard that they can boost themselves up and stand on. This could make them fall or help them scale clear over the gate. Rule out most pet gates. Make sure you read between the fine lines when making a gate purchase to ensure you aren’t picking up a pet gate. The spaces on a pet gate are much wider and could allow a body part to get stuck in a space/opening. Skip hand-me-downs. While hand me downs and family heirlooms are nice, they aren’t always up to date on regulations. And, they can pose a threat to your kids. Always make sure your gate is JPMA approved by looking for a seal, sticker, or marking on the gate itself or its box. Model positive behavior. If you want your child to be safe and not try to climb over their gate, then model correct behavior. If they constantly see you going over top of the gate, they may be likely to want to do this same thing. This is where a latch/door on a gate plays an important role. Keep gates closed and latched. This prevents injuries and damage to your gate. Put a gate at the bottom of your steps. Many parents focus on putting a gate at the top, that they forget about the base. Often times they feel like they don’t let their children out of their site, but it can and does happen from time to time. A gate at the base of the stairs does not allow for any exploration or accidents. Also, it’s important to be aware of what not to buy. Old-fashioned accordion-style gates, diamond-shaped spaces between slats, and gates that boast v-shaped openings at top are safety hazards. Always select a gate with a horizontal filler bar across the top. In addition to safety, also consider some of these do’s and don’ts before your install. Keep in mind that installing a gate can be difficult. However, no matter how time consuming it is, remember that it’s necessary. Install the right gates in the proper places. For example, if you have molding around your door frame or floor, you may need to purchase an additional installation kit for special circumstances. Don’t try to cram it in a space it won’t fit correctly or hug snugly. Install hardware into a wall stud or solid wood. This helps you ensure your gate is installed properly and won’t rip out if it’s pushed upon. Use screws that are long enough. The longer the better! Ask. If you’re not great at following directions, installing hardware, or if you don’t consider yourself “handy” there’s no shame in asking for help from family or friends. You could even hire a local handyman to get the job done, for a reasonable price. Install your gate too high. This could cause entrapment. Your gate should sit no higher than 3 inches off the ground. ​Install latches or hardware into round or uneven banister posts. This could result in the wrong kind of fit and not just damage your home, but cause harm to your child. Guess. Never take a chance with the way you installed your gate. If you’re missing parts, always contact the company or visit your local hardware store to get what you need. And, if you don’t feel like you’ve installed the gate perfectly or if it’s not fitting as desired, reinstall it again or send it back to get a different kind. The Supergate Easy Close from North States (click here to check the price on Amazon) is perfect for keeping both children and pets out of a restricted area. Ideally, it is best suited for the bottom of stairs or between rooms. It is made from a sturdy white metal that will be durable enough even through the abuse your little one will give it. Triple Locking System. This product is completely secure. However, it can usually be opened with one hand after a few tries. The locking system makes it a little more difficult to open when your child becomes older and learns to tinker with things. Door Opens Two Ways. Perfect for when you are attempting to gain access from either direction. No Assembly Required. The easy to install tension knobs can be locked securely into place within minutes. Also included is an extension bar for openings up to 38.5 inches. Can Be Squeaky. When opening and closing, the metal occasionally rubs the wrong way, making it squeak. A squeaky gate can be frustrating if your baby is asleep. The Regalo Easy Step Walk Thru (click here to check the price on Amazon) is designed as an easy step thru unit that's ideal for doorways, hallways, as well as both bottom of stairs and top of stairs. Approved by JPMA and the ASTM so you know the quality is there, enjoy a secure product that will keep both children and pets where you want them. Wall Cups Included. For a more secure fit, four suction wall cups are provided. If you plan to use it at the top of a staircase, these cups are ideal. It’s Portable. Within minutes you can easily install or remove it, making it great for travel or use throughout your home. This Regalo also stows away flat for easy transport and storage. One Handed Latch. The latch will be easy to open for you, yet hard for your little one. The motion can be slightly awkward. It may take a few tries to master it but once you do, it will be it can be done easily. Only Swings One Way. This may or may not be a deal breaker for you, but it's something to think about when doing your installation. Narrow Door Opening. At a mere 16 inches, it can be tough to get through, especially carrying a child or bag of groceries. The Multi-Use Deco Extra Tall Walk-Thru by Summer Infant (click here to check the price on Amazon) is one that will work with just about any space. This product is highly attractive looking especially compared to some older models. The pressure-mounted system is perfect for easy installing and not permanent. Featuring added height to ensure your child won’t be able to open it, even in their later toddler years. Auto-Close Walk Thru Door. This Summer Infant unit automatically closes behind you, so you won’t have to worry about always double checking the latch. Removable Door Stopper. The stopper prevents the door from opening a particular direction. You may want to consider this option if you plan to use it at the top of stairs. Extra Tall. At 36 inches tall, your little one will have a harder go at trying to get it open. Can Slam Shut. While the auto-close door is great, it has a tendency to slam. Potentially it can trap tiny fingers if not careful. It’s Cumbersome. It can be somewhat tricky to open. As it requires two different motions to open, it can sometimes be hard to do one-handed. North States has created another well-built option with their Supergate Easy Swing & Lock Metal (click here to check the price on Amazon). This heavy-duty metal unit is ideal for at the top of stairs. You can trust that when properly installed it will hold up to just about anything your toddler or pets throw at it. No Threshold to Step Over. Unlike pressure-mounted gates, there is nothing to step over. This eliminates a possible tripping hazard which can be dangerous for you and your newly walking toddler. Swings Out of the Way. When not in use you can easily push it completely open and out of the way, giving free passage. Wide Door. Since this unit opens completely from one side, you essentially have your entire walkway to pass through. The wide door is ideal for pushing strollers through or when carrying your baby. Pain to Install. To get this North States unit to function properly, you will need to install it with little error. Get someone handy to install it for you! It’s A Bit Noisy. For the lock to be latched securely, it needs to click into place. It’s nearly impossible to latch it without making even the slightest of ‘click’ noises. A truly secure option for just about any high-traffic area in your home, the Cardinal Gates Auto-Lock (click here to check the price on Amazon) is easy to install, easy to use and made from quality materials, making it an all around great choice. With a patented latch that allows you to pass through quickly, in either direction, this aluminum offering is hard to beat. You can be assured that your child will be safe and secure. Aluminum. Lighter weight than steel, yet strong enough to stand up to years of use without weighing down your wall. Aluminum finish is rust free and perfect for outdoor use. Easy to Clean. Complete with a powder coated finish to give you something that is easy to wipe down for a long time to come. Easy to Install. The instructions provided are easy to understand, and all hardware is provided for a quick install. Needs a Stud or Door Base. If you plan to install this into drywall, you will need to purchase longer screws from your hardware store, and most likely anchors. This unit can be fitted at an angle if that helps as well. It’s Loud. The automatic closure can be pretty loud when it shuts. If everything else sounds great about this one, you can try adding a piece of felt at the closure points for a quieter close. A really popular top of stairs option is the Safeway by KidCo (click here to check the price on Amazon), one of the better options for parents who have multi-level homes. Although this unit was designed specifically for the top of the stairs use, it can be a great option for blocking a room or hallway as well. Consider this option if you are looking for a quality choice that will hold up with loads of use. Directional Stop. This stop prevents the product from having the ability to swing over the stairs, preventing unwanted accidents. Can be Mounted at an Angle. If you have an awkward area that needs to be blocked off, it won't be a problem for this versatile option. Quick-Release Hardware. When the KidCo is not in use, or not needed, it can easily be taken down and stored. It’s Sturdy. This model is made with heavy-duty steel construction. The bars are welded nicely and will not bend even with a great amount of force. You can be confident that your child or pets won’t be able to damage it. Not Quality Hardware. While the installation is fairly easy, you may want to consider your own screws. The provided screws are a bit too small for a completely secure fit. Lock Sticks. The latch can sometimes jam, making you constantly have to double-check it. If the latch isn’t on properly, it won’t stay closed when pressure is put on. The Evenflo Easy Walk Thru Stairs (click here to check the price on Amazon) is a four-point hardware mounted unit that will keep your baby safe from common household dangers, especially when stairs are involved. If you are looking for a tall, easy to use, top of stairs approved product, this might be the one for you. You can also use this in some other capacities such as hallways, between rooms, and bottom of the stairs. Lock Indicator. An easy to see red/ green lock indicator ensures you that this is fully latched. With a simple glance, you can be worry-free about your little one’s exploring. Added Height. This Evenflo measures 30 inches in height. It can safely be installed 3 inches above the ground for 33 inches of protection. Your child won’t be able to reach the top of it to fiddle with the locking mechanism. One-Handed Open. An ergonomically designed handle is perfect for daily use. The easy-glide handle is easy to use for an adult but difficult for a baby. Wide Swing. While a wide swing can be perfect for when you have the baby in tow, if you don’t measure your space accurately, it can wind up hitting a wall. This could cause damage to the wall and virtually render the product useless for that space. Tools Not Included. Before purchasing this unit, make sure you have the tools to install it. You will need an electric drill, and a 9/64 drill bit to complete this installation. The Easy Expandable Metal by Regalo (click here to check the price on Amazon) is one of the best tops of stairs options available. Certified by the JPMA and meeting the safety standards of the ASTM, you can be confident your child will be safe and secure. Made from high-quality materials gives you the option to use it over the span of multiple children. Stabilizing Foot. The stabilizing foot provided gives you an added sense of protection and balance. Banister Adapting Kit. Included with this top of stairs unit is hardware for wall mounting, as well as a banister mounting. The banister mounting kit (4 square, 1 round) are adjustable to fit your banister without drilling or damaging your woodwork. Lightweight and Portable. With a few minutes time, this can easily lift out of its banister mounts for quick storage when not in use. The durable, yet lightweight steel allows for easy lifting when needed. Tension is Tough to Maneuver. It is somewhat difficult to open and close this with one hand. If you have your baby with you, you may have to set them down before closing the gate. The tension in the spring requires quite a bit of force and is hard to get used to operating. Plastic Hinges. Most of this product is made from metal. However, the hinges are made from a lightweight plastic. These hinges could potentially not last as long and need replacing. Because of the plastic, it does not make as much noise as some of the others, so this could be a toss up. The Deluxe Easy Step Extra Tall (click here to check the price on Amazon) is another great looking option design by Regalo. This one is a whopping 41 inches tall (nearly 3 and a half foot). Like most products by Regalo, it's certified by the ASTM. You can be assured that it will be safe for your little one. Pressure-Mounted Design. The pressure-mounted design is easy to install and won’t leave marks on your wall after you’re done using it. Walk Thru Door. Whether your hands are full with a load of laundry, groceries or your little one, this walk thru door allows you to pass seamlessly. It's Well-Built. All components of this model are made from high-quality materials. The locking mechanism is sturdy and easy to use. The bars are made from a tough steel and grips well to the wall for a secure fit you can trust. Tripping Hazard. Pressure-mounted units are nice, but leave a bar on the bottom that you have to remember to step over. It can become a tripping hazard for both parents, and your little one that is learning to walk. One-Directional Door. Unfortunately, you can only choose one way for your door to swing open due to the lock at the top. Make sure to take this into consideration when mounting your extra tall unit. 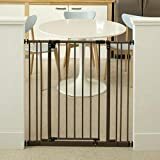 The Supergate Deluxe Decor Metal by North States (click here to check the price on Amazon) is a stylish option that's perfect for even the widest space you may want to you your baby restricted from entering. It's hardware-mounted for a secure fit that won’t budget once installed. Made from heavy duty steel construction that is built to last. Large Walk-Thru Space. At 25.5 inches wide you can go through this space with a breeze even if you are loaded down with laundry, groceries or your baby. No need for turning to the side or lifting things above it. It’s Versatile. You can choose to leave the walk through open when not in use, or completely swing the entire thing against a wall until your ready to c﻿hildproof your area again. High-Quality Materials. Once it's hardware mounted, it’s not going anywhere. It is durable enough to keep an unruly child from breaking through the barrier. It Looks Great. It matches just about any style of home décor you may have while maintaining a secure, safety zone for your little one. Difficult to Install. If you have lower trim work in your home, this product can be hard work to install correctly. Mounting it above the trim can be a tripping hazard due to the bottom beam, which is meant to rest on the floor. Latch Can Stick. Occasionally, the latch will not stick properly and needs a little help. A good wiggle here and there seems to do the trick, but if you have your hands full with a squirming baby it could be annoying. The Regalo Extra Widespan Walk-Through (click here to check the price on Amazon) can be adjusted to fit wide spaces with ease. Not only does it look great, but it will allow you to expand it to fit just about any doorway or opening. You may want to choose this option if you are looking for an adjust pressure-mounted baby gate that is wider than most. Pressure-Mounted Install. Within mere minutes you will be able to install and begin using it. When you are ready to put it away, simply release the pressure and store for future use. It’s PVC-Free. PVC is the most toxic plastic for children’s health. Currently, there are no formal standards when it comes to PVC products globally. However, there are many companies that are opting to remove them from products themselves. Extensions Ranging in 3 Sizes. With the 6, 8, or 12-inch extensions, you should have no problem finding a perfect fit for your extra-wide entryway. Don’t Over-Extend It. When over-extended (above 58 inches) it can become not as sturdy. The product itself will allow you to reach around 61 inches, but there is a maximum width for a reason. Narrow Opening. It can be difficult to squeeze through the 15.5’’ opening if you are even an average sized person with an armload of anything. You will need to lift items above your head or slide through sideways. The Pop N' Play Portable Playard from Summer Infant (click here to check the price on Amazon) might be worth looking into if you are in need of something lightweight and easy to use. The Pop N’ Play truly is a versatile way for you to instantly give your baby a safe play area within minutes, just about anywhere. This large play area is great for families with multiple small children or twins. Indoor and Outdoor Use. Complete with a water-resistant floor, this baby playard is perfect for both indoor and outdoor use. All materials are easy to wipe down or shake off, making it good for indoors, grassy areas or a day at the beach. Compact Fold with Travel Bag. Unlike other similar playards, this one is incredibly easy to collapse or set up when you need it. Within seconds you can have your playard in it’s lightweight travel bag under your arm. Spacious. At 14 feel your little one will have plenty of space to roam and explore without getting bored. Plenty of room for multiple children as well. Metal Bars. Due to the lightweight, portable design, the bars on this play yard are not padded very well. Your baby may wind up with a bump or two on the noggin if they are playing too rough. Unable to Remove Cover. While the cover is easy to spot clean, over time the play yard will need a serious washing. The problem is, the cover is attached to the bars, making it a difficult task. 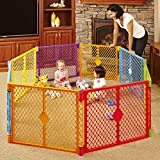 Another playard popular amongst moms is the North States Superyard Colorplay (click here to check the price on Amazon). Your little one will love the bright, bold colors of his fun play area. You might want to consider this option if you are looking to contain your child in an area that is both portable and easy to clean. Easy to Clean. You know more than anyone that kids can be very messy. When your play area becomes soiled or in need of washing, simply take it outside and hose it down. Non-Slip Pads. You are supplied with 16 non-slip pads that are good for any surface in your home. A great option if you want to keep the integrity of your hardwood floors. Easy to Open. With this playard, there is no more climbing over or lifting bending down and lifting your children out. The easy open feature detaches and gives you easy access to the play area. Grid Pattern. The grid pattern practically begs your baby to shove their fingers and toes in the holes. This could potentially be a dangerous situation if your little one begins to climb the fence. Not Super Stable. When your child becomes older (and stronger), this playard has the potential to move around. For a more secure fit, you can place the area in a corner, or use zip ties to secure it in place. The North States Supergate Step-N-Go (click here to check the price on Amazon) functions and looks great at the same time. The twisted steel bars add a classic touch of elegance to your home while maintaining your child’s safety. This pressure-mounted unit offers a secure fit to any wall without damage. If your family is searching for a product that can be opened hands-free, this may just be the one for you. Both Foot Pedal and One-Hand Operation. Whether your hands are full with your baby and a lunchtime snack or not, you can easily open it in two ways. Both the hand and foot option are two separate motions at once, making it child-proof while easy for parents. Self-Closing. It will close by itself behind you, keeping your little one, or pet, in their desired area. You have the option to lock it open as well if you like. Door Swings Both Ways. Whether coming or going, you can open this door by pushing or pulling. This door is great for quick access when your baby wakes up from a nap, scared and confused. Pinching Hazard. With the foot mechanism so low to the ground, your baby is at risk for potentially pinching their tiny fingers and toes. Tough to Open. The foot pedal is within baby’s reach, so the design has to be somewhat tricky or else you would have an escapee. Once you give it a few tries, it’s fairly easy to do. The Summer Infant Step to Open (click here to check the price on Amazon) is a pressure-mounted unit that comes loaded with bells and whistles. With this unit, you have the ability to open it in two easy ways for adults, while maintaining a secure area for your little one. The Step to Open is perfect for families that need a high-traffic area blocked off or restricted, yet still allows easy entry to adults via the foot pedal or a one-hand motion. Dual-Sided Pedal. When installing the Step to Open, you can choose to have zero, one, or two pedals attached. If you only plan to open the door with your foot in one direction, you can install only one for a more secure fit. Pressure-Mounted. These types are great for putting in your home if you are looking for a temporary solution that won't leave markings on your walls. High-Quality Materials. This Summer Infant is well-built and can withstand the pressures of daily use. All features seem high-quality giving you peace of mind that your child is restricted from potential harmful areas of your home. Self-Closing Door is Overzealous. It does tend to close extremely rapidly and can hit your knees or ankles as you step through. The only way to stop this is to use your hand or hip as you enter sideways, which can defeat the purpose of a hands-free unit. Latch Doesn’t Stick Properly. After months of use, the latch on the Step to Open won’t stick as often as you would like. You will need to double check that it in fact locked, which can be hard to remember in chaotic situations. The Evenflo Soft N Wide (click here to check the price on Amazon) is great for closing doorways off in a pinch. Whether you choose to use this in a static position or travel with it, the lightweight design is perfect for restricting access to potentially hazardous areas. When not in use, take it down quickly for easy storage. Easy to Clean. The 100 percent polyester is very easy to spot clean or wipe down when it gets messy. Individual Tension Rods. The top and bottom tension rod act individually. This is great for areas where you may have baseboards. Other options would need to be lifted above the baseboard before using, making them less sturdy. Hard to Climb. This unit is solid and won't provide your little one with many holes to climb, which can lead to the wall being knocked down. No Walk-Thru. At 36 inches tall, it can sometimes be hard to step over. If you are a smaller person in stature, this may not be the one for you. If all you want to do is block access to an area, it’s not as big of a deal. Not Recommended for Top of Stairs. This is pressure-mounted, making it less sturdy than hardware mounted options. It is not safe for top of stairs. The North States Portable Travel (click here to check the price on Amazon) is a pressure-mounted model that's ideal for the parents on the go. It can be used throughout your home, quickly taken down and ready for it’s next location. It's a good fit for parents searching for something that truly is versatile. Can be Used on Uneven Walls. No matter how unique your space is, this can likely be installed there. Install it all an angle or straight across for a snug fit your little one won’t be able to escape. Easy to Spot Clean. The fabric is completely removable, giving you the option to hand wash it when it becomes extra soiled as well. Travel Bag for Quick Trips. Carry it anywhere you go with its travel bag. Leave it in the car or bring it on a plane for easy transport. Has a Tendency to Bunch. If you are using this product without it being fully extended, the fabric can bunch in places. Not only does this look bad, but it also gives your child extra fabric to grab onto and potentially climb. Step Over. This unit is 29.5 inches tall once bars are installed and be cumbersome to climb each and every time. Choose this for an area you want to block off, but not necessarily pass through a lot yourself. 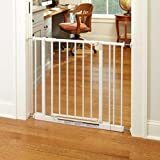 Although the Freestanding Pet Gate by Richell (click here to check the price on Amazon) is marketed as a pet product, it can easily be converted into a baby gate. The gorgeous wood finish looks great in just about any home while remaining functional. This product might be for you if you have a large space that needs restricted and want something that can stand on its own. Easy Step-Over Design. At only 20 inches in height, you can easily step over this unit to gain access to the desired area. The height also functions great for helping your baby learn to walk without worry of tipping. Side Panels Prevent Tipping. The side panels are weighed out so that your little one won’t easily be able to tip it even when standing up against it. Fits Very Large Spaces. If the space you need to block off is large, then this might be the one for you; it expands safely and securely up to 71.3 inches wide. It’s Bulky. This large wood unit is heavy and hard to move from space to space. It does fold up for storage, but it’s still larger and heavier than other styles. Not Great for Pets. If you have larger animals such as dogs, they may be able to step over the it somewhat easily. The wood material may appeal to some dogs when it comes to chewing. The last thing you want around is yucky splinters. Safety gates are essential the first couple years of your baby’s life. They protect your child every step of the way, and teach them about limits. Choose a gate that best suits the needs of your baby and the setup of your home. Consider the important features that make a gate great and not just good, and be sure to adhere to safety tips while using one!